We were not sure what to expect. I signed up for The Urban Bike Adventure via Amazon Local and only received a ticket. The website was equally vague. Honestly I had forgotten that I bought the tickets some months ago, and then it popped up on my calendar. I recruited my friend Alison and team “Sactown Friends” was ready to go. The Urban Bike Adventure (TUBA) team made full use of social media. We received text message updates; advance clues were provided via Twitter and Instagram, and they encouraged people to bring a computer or digital camera (practically speaking: a smart phone will do). Bike helmets are required so Alison purchased hers just the day before and forgot to take off the tag. We decided it added to her look! 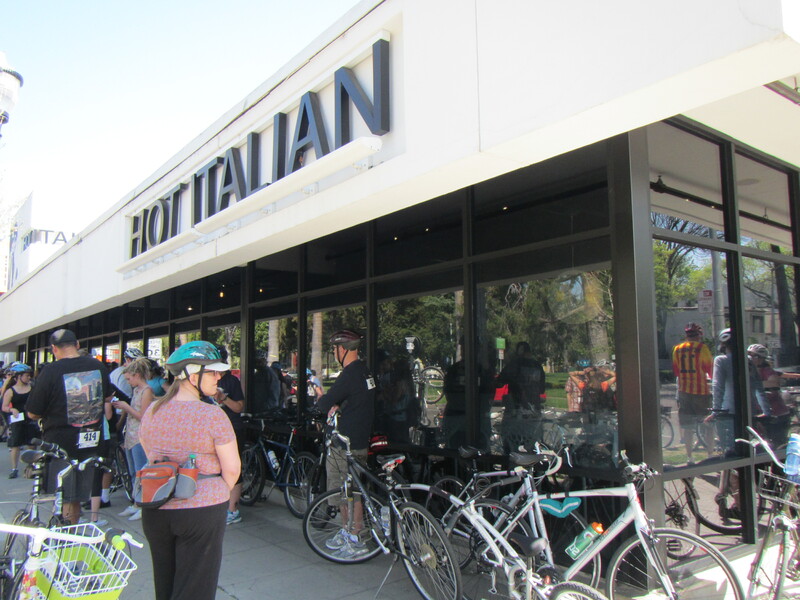 We arrived at the pizza place Hot Italian at 16th and O Streets in Sacramento about 11:30 a.m. We registered and we were none the wiser about what to expect. We sized up the crowd and felt reassured that this event did not require one to be a Serious Cyclist. We got our Clue Sheet at noon and interpreted the instructions to “be sure to read all of the clues and directions carefully” as permission to solve the clues and plan our route for fastest time. We had a great time and it reminded us of a Young Life event. Everyone in the team has to be in the photos so it forced us to ask for help from other teams and strangers. The clues took us to Old Sacramento and Land Park and I learned Sacramento is very busy on the weekend! 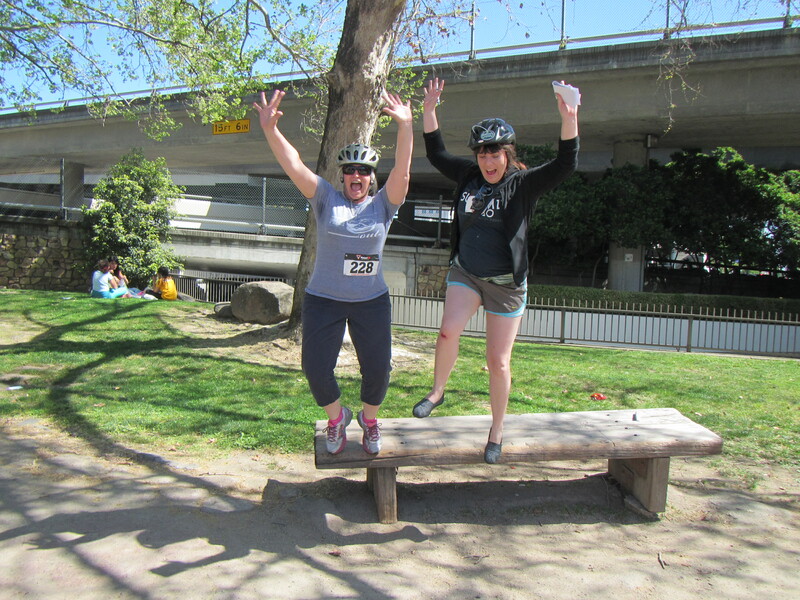 A friendly competitor suggested we jump for joy off a bench to ensure all four team feet off the ground. We had to recruit a stranger to sing for us as we did background moves (I promised Alison the video would not end up on YouTube!). 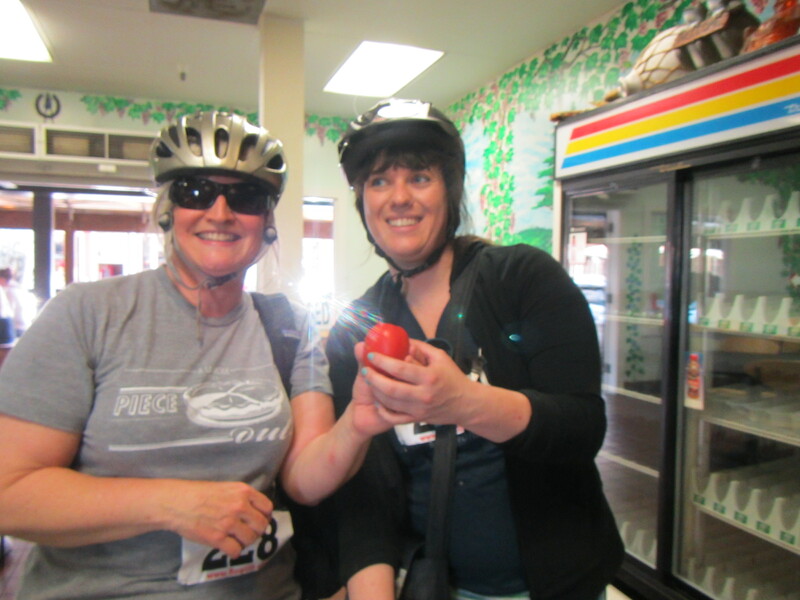 We probably bicycled about 15 miles over the 2:09 it took us to complete the tasks. We did not expect to be competing for a top prize and yet we were among the top 20 teams! I also learned that there is a Funderland next to the zoo and Fairytale Town. How did I escape going there with my children? The event takes place around the country and $2 of every entry goes to the Wounded Warriors nonprofit. We definitely recommend this event for friends, families or co-workers who want to team build. We are looking forward to next year. 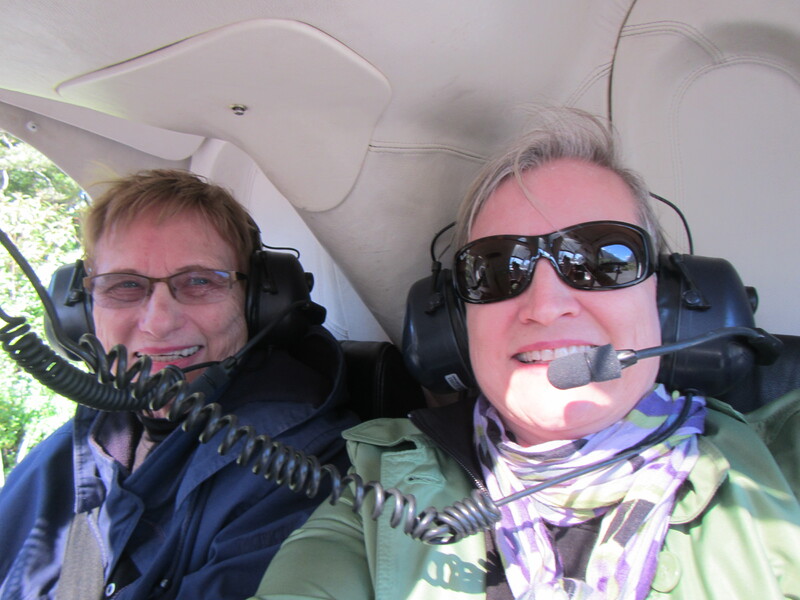 The most thrilling experience Mom and I have shared is flying in a helicopter and landing on a glacier above Milford Sound. She might argue that it was my birth, but I need only remind her that I was not a very cooperative newborn. I also present as evidence that on this day in February were both smiling. Neither of us had flown in a helicopter or landed on a glacier until now. We flew into Milford Sound, climbed up the face of a cliff and tipped over the edge (keep breathing!). Then we flew over mountain peaks to Mount Tutoko and lowered onto the glacier. Pilot Sarah instructed us to get out carefully and only walk to the front of the helicopter. We gingerly dropped onto the glacier and then enthusiastically snapped photos.  I even took a picture of the so blue sky. We climbed back in the helicopter and this time we rode in the front. My mom was still wearing her grin. (She did not stop smiling the entire trip.) 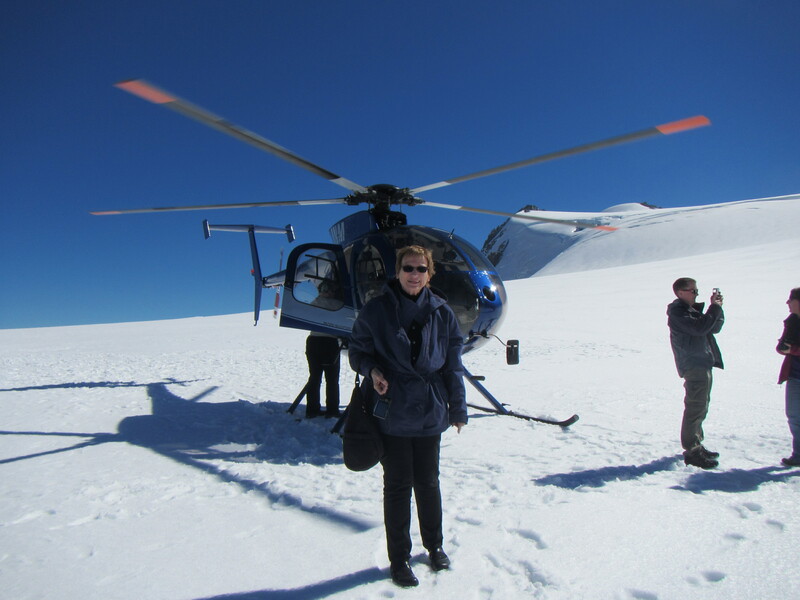 We lifted off from the glacier and flew over more mountain peaks to a landing pad just on the other side of the one-way tunnel and met up with our terrific bus driver and continued with our group back to Queenstown. The entire trip was the most thrilling and memorable 30 minutes Mom and I have enjoyed together. 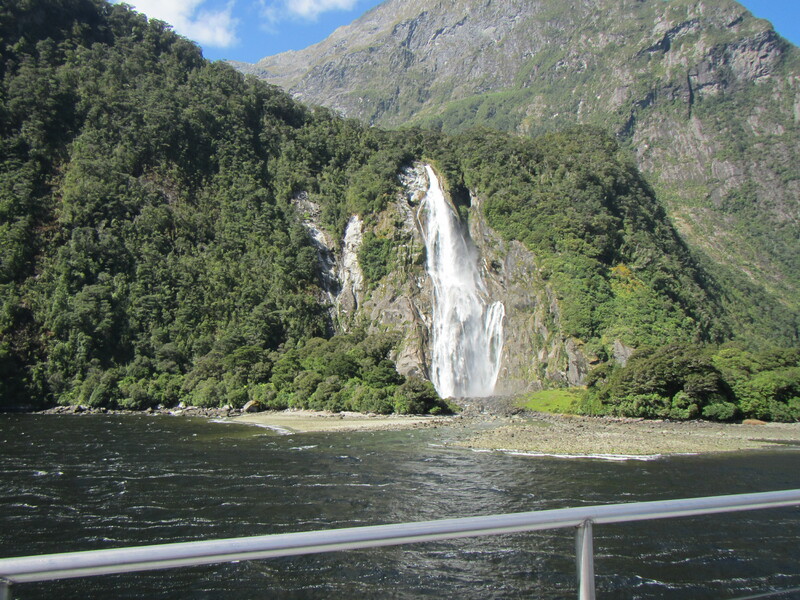 I had read so many rapturous accounts of Milford Sound that part of me expected to be a little let down. 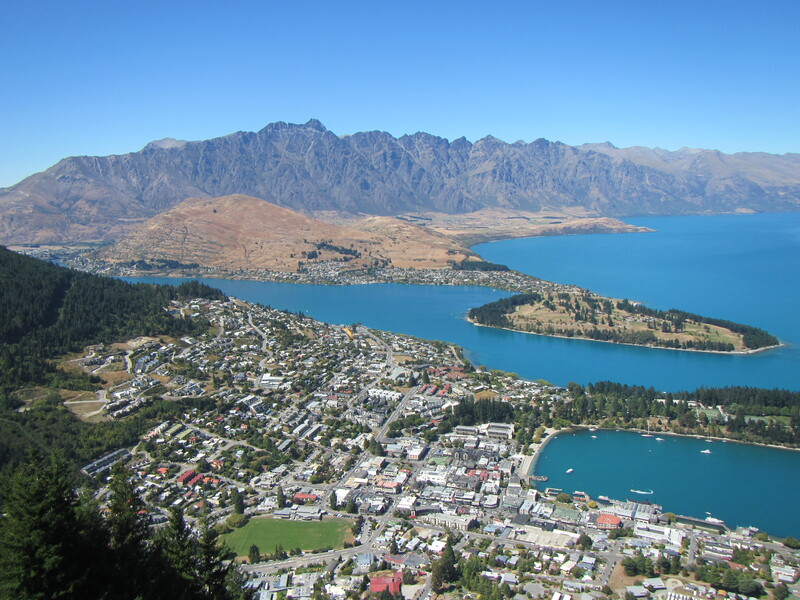 Then we got to Queenstown and I was so bowled over by the beauty and I wondered if it could be better than the views of Lake Wakatipu or the Remarkable mountains. We booked the Real Journey‘s tour of Milford Sound and joined a busload of people heading out of Queenstown at 7 a.m. in the morning. We drove along Lake Wakatipu and then entered an agricultural valley with sheep and commercially-reared deer in the paddocks lining the 2 lane road. When we entered the area called Fairlight I felt my body relax and exhale a sigh. The light and air were so lovely. We stopped at Mirror Lake and we gaped at the beauty. We took a bathroom break and grabbed a coffee in Te Anau (Tea Ah Now). I grabbed some yummy meat pies at the bakery even though we were provided lunch as we boarded the boat. I was surprised that you had to pay $1NZ to use the public facilities. These were outlawed in California in the 1970s because they are discriminatory to women (men can go anywhere!) However, there was a full time attendant and it was very clean. At last we arrived at the Milford Sound harbor and moved from the bus to a boat. Mom and I hung out on the prow of the boat, braving the elements to avoid getting seasick. The wind was strong on the way out and not a factor on the return. The weather was so fine it was stunning. 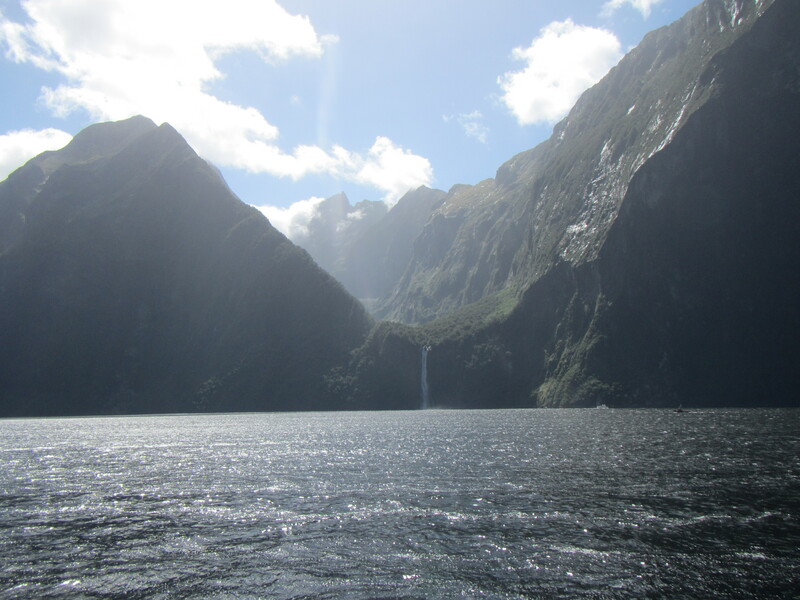 Milford Sound is a fiord and a mighty fine fiord. I kept my eyes wide open for a kea parrot or a Fiordland penguin. Alas the only wildlife visible were New Zealand seals. I took 589 pictures on this day! These are just a few of the wonderful snaps I captured. One of many waterfalls in Milford Sound. 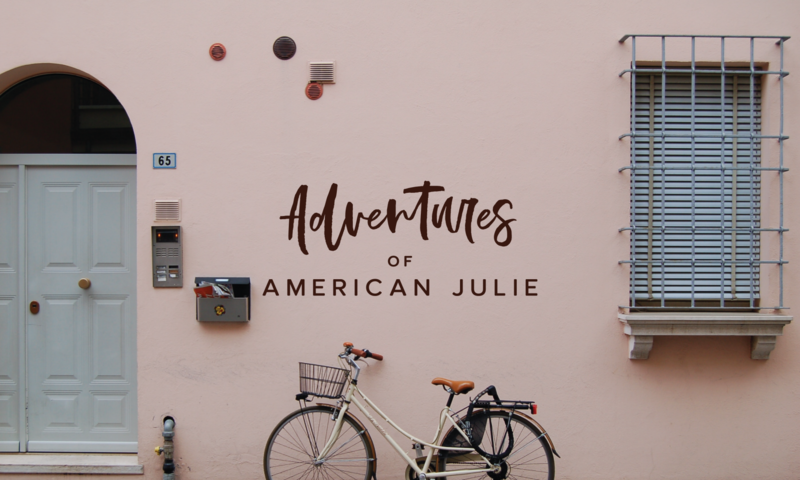 What is the opposite of an bungy-jumping, parasailing, luge riding tourist? Me, my mom and friends. I could not even convince all of them to take the gondola ride! 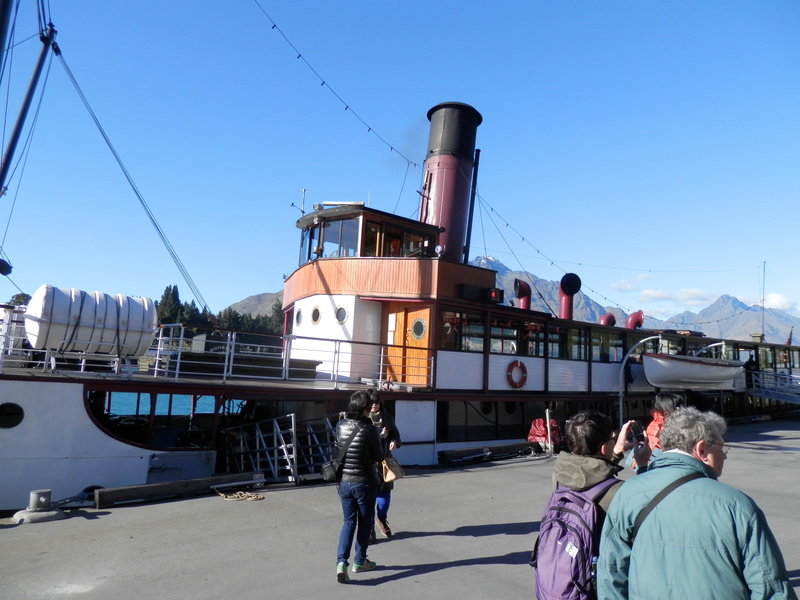 We still enjoyed Queenstown and nearby Arrowtown. 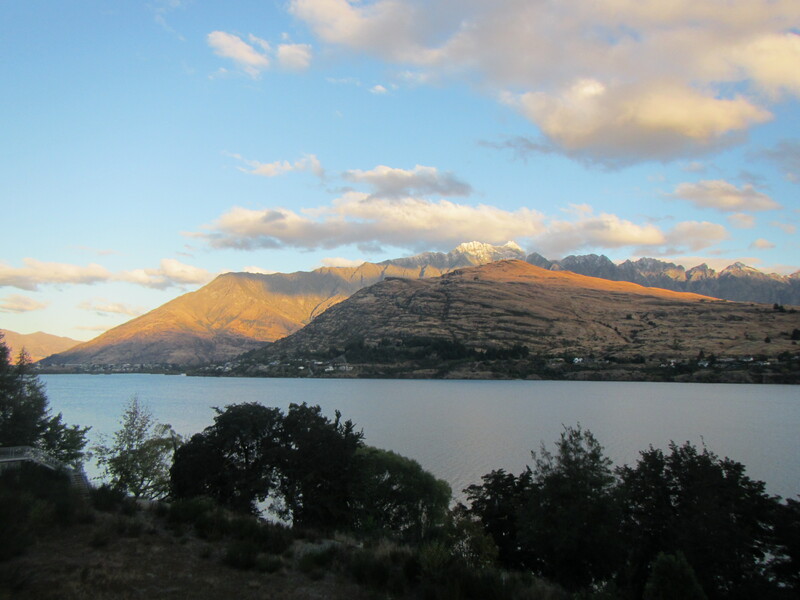 Staying at The Rees hotel means having to overcome the temptation to stay in room all day gazing at the gorgeous view of Lake Wakatipu and watching the weather and light move across the sky. We all agree that our 2 bedroom apartment was one of the nicest we had ever enjoyed and the kitchen was much larger and better appointed than mine at home. Plus they have a great dining room, True South, with a creative albeit pricey menu inspired by local ingredients and room service. The first day Mom and friends took the hotel shuttle into town and joined the Real Journey’s lake cruise on the TSS Earnslaw to a sheep station and enjoyed a delicious barbeque lunch. They loved it and highly recommend this experience. I took advantage of a quiet day of walking around town and caught up on emails and did some light grocery shopping. Queenstown is truly beautiful. Comparisons to Lake Tahoe are inevitable and full of so many exceptions it is not worth the breath. It stands on its own. 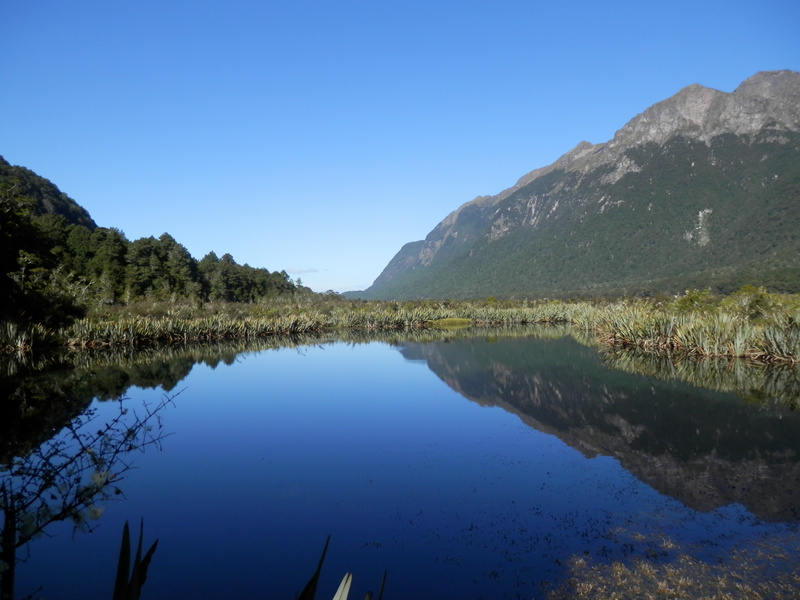 The next day we spent in Milford Sound and that will be its own post. The final full day in Queenstown we took a cab into town and we all enjoyed the Kiwi Birdlife Park, especially the conservation show and the kiwi house at feeding time. Lisa and I bought combo tickets that allowed us a ride on the gondola. The trip up the mountain in the gondola took only a few minutes (less than the line we waited in to board). We were at the shrine to adrenaline in Queenstown. Mountain bikers hung their cycles off their gondola chair and headed up looking dusty and determined. We lofted above the luge ride and watched the bungy jumpers prep for their brave leap. As we approached the top we level with the paragliders as they took off over town. The views at the top were as spectacular as you might expect. 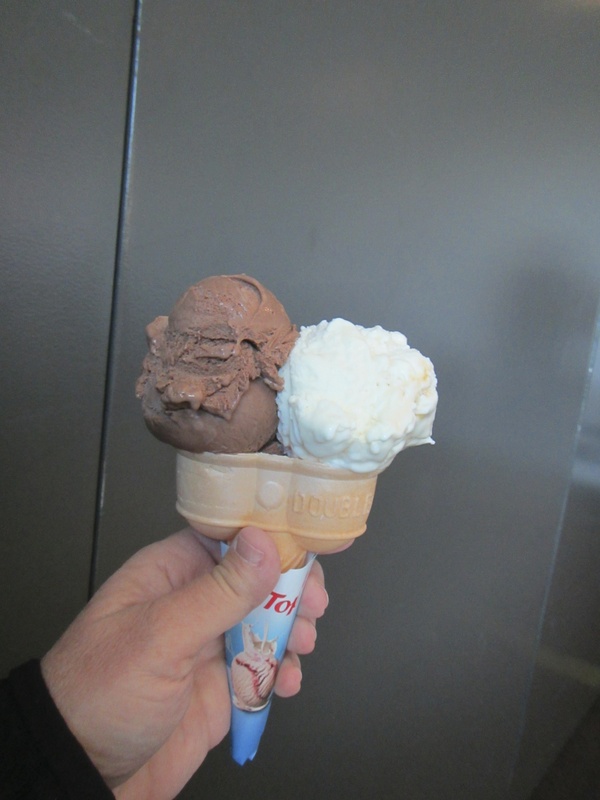 My best memory was the incredible Tip Top ice cream cone! We rejoined Mom and Nancy and we called a cab to drive us to Arrowtown. Several friends recommended checking out this charming gold rush town. It is lovingly maintained and an interesting place for shopping and dining. We ate delicious blue cod and chips at the Fork and Tap. We were ready to head back The Rees and attempt to eat all the food still in the fridge. My crew was definitely from the waste not-want not generation. As we watched the light fade over the lake we understood deep in our souls why so many people make the effort to visit Queenstown. Oh what big hearts knitters have. We knit caps for kids in the cold, blankets for children who have lost their homes to fire or are hospitalized, prayer shawls for people battling cancer. I could go on and on. Not surprising when a post about penguins in need of sweaters appears on Facebook it goes viral. Today I saw 3 separate posts. Aided by the animal lovers the appeal is irresistible to many. Warning: penguin sweaters or jumpers are not needed at this time! And sort of not true. 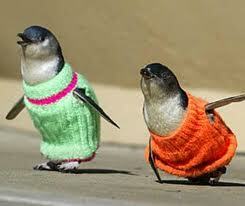 If you are just finding out penguins slicked with oil do not need sweaters, I know how you feel. I was in Auckland, New Zealand during 2011 when the non-stop coverage of the Rugby World Cup was interrupted to announce the Rena cargo ship disaster. In what seemed like slow motion the Rena ran aground off shore of the port in Tauranga (SE of Auckland) on the North Island. The fate of the cargo was not known for weeks but the oil on board started leaking immediately. The local residents also responded immediately. I became fascinated with the rescue effort. The local iwi (Maori tribe) organized themselves and others to go to the shoreline and wash rocks! Local wildlife conservationists with oiled bird experts around the world converged on Tauranga to stage an impressive rescue operation. They quickly focused on the little blue penguin (the actual name and accurate descriptor). Flashback to 2000 when a similar oil spill occurred 1300 miles away on Phillips Island in Australia and knitters responded to the call for sweaters to aid the penguins. The response by knitters was so overwhelming the Phillip Island Penguin Foundation ended up with a lot of excess sweaters. Just days after the Rena crisis someone posted the penguin “jumper” (sweater) pattern on Ravelry (a popular knitting website) and the Skeinz wool shop in Napier offered to collect them. This was all based on “a friend of a friend” hearsay about the rescuers’ need. Too late, it went viral and hundreds of sweaters poured in from around the world. I was so fascinated with the plight of the little blue penguins I even wrote it into my mystery novel as a sub-plot. I also fell in love with penguins. So fast forward to December 2012 and I am on a road trip with UK Sarah and we are staying at the Mt. Tutu Ecolodge near Tauranga. I asked several places in town for more information about the penguins and came up with no leads. I mention this to my host Tim Short. Serendipitously he was integrally involved in the rescue. I naively and enthusiastically asked him about the sweaters and then I learned the truth. They did not use any of the sweaters. The birds were understandably under duress and dressing them up in sweaters increased their stress. Instead they used warm water and heat lamps and lots of baths. I had to let go of a cherished belief that knitters made a difference for the penguins. Nonetheless, the rescuers results are very moving. Everytime I watch this video I get emotional. The response to the call for penguins jumpers is always met with terrific enthusiasm. It gives us something tangible to do when confronted with uncontrollable circumstances. We cannot realistically foreswear using oil and oil byproducts so we all bear some of the guilt from any spill. Knitting a wee sweater allows us to help our “neighbor” the penguin and feel a little bit better. 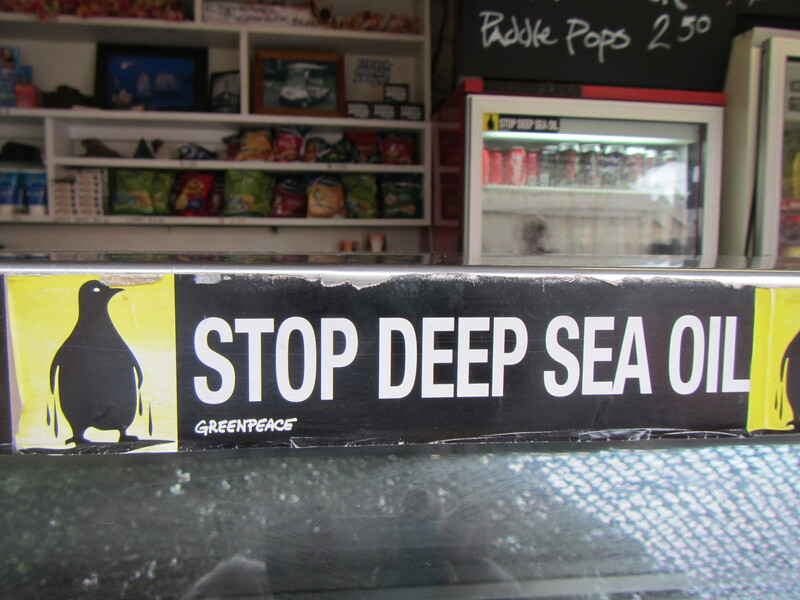 Knitting a penguin sweater is easier than stopping deep sea oil drilling. This latest call for sweaters is not a prank. Remember the Phillip Island Penguin Foundation in Australia? They used their excess sweaters from 2000 on toy penguins and sold them as a fundraiser. Recently they asked for help in knitting more to continue to use them on plush penguin toys. Somehow that was lost in translation as the story went viral. This lamb burger with bacon and avocado inspired much photography. There is a lot to love about dining in New Zealand. Fresh, local food is easy to find. Gluten free is catered to, although the regular breads are phenomenal so I am happy I am not sensitive to gluten. The eggs are all free range and some of the yolks are so yellow as to be neon orange from a diet of greens. The dairy products are among the best in the world. (I ran the gauntlet of US customs to bring home Edam cheese.) The beef and lamb are yummy because they are grass-fed. The wine, the bacon, the honey… obviously I could go on and on. 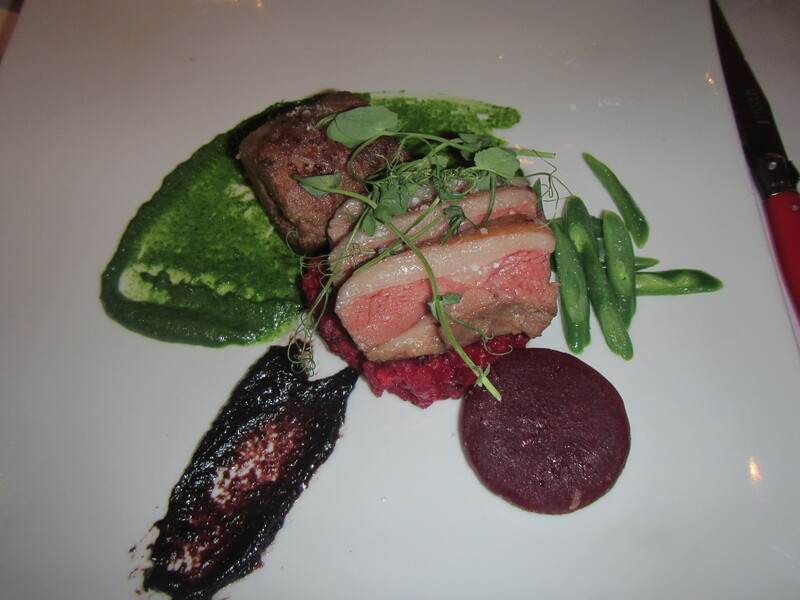 This lamb dish was delicious and beautiful. 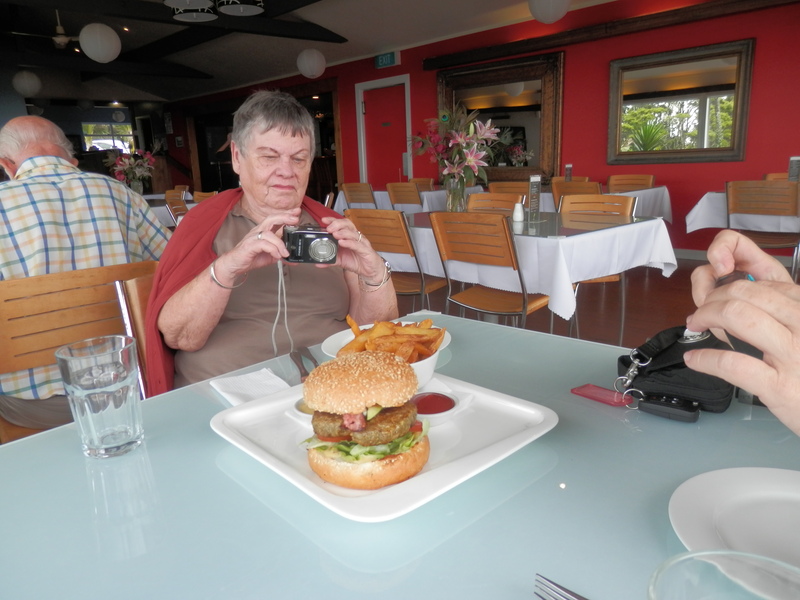 The food in New Zealand is not cheap. Even when you factor in the exchange rate (lowers price to Americans and Brits), and tax is included in your bill, and tipping is not customary, food is more expensive than in the United States. There are no 99 cent deals on any menus. Step out of the mindset of quantity over quality, “value” equals mass, and embrace the idea of high quality, tasty food served in just enough quantities. 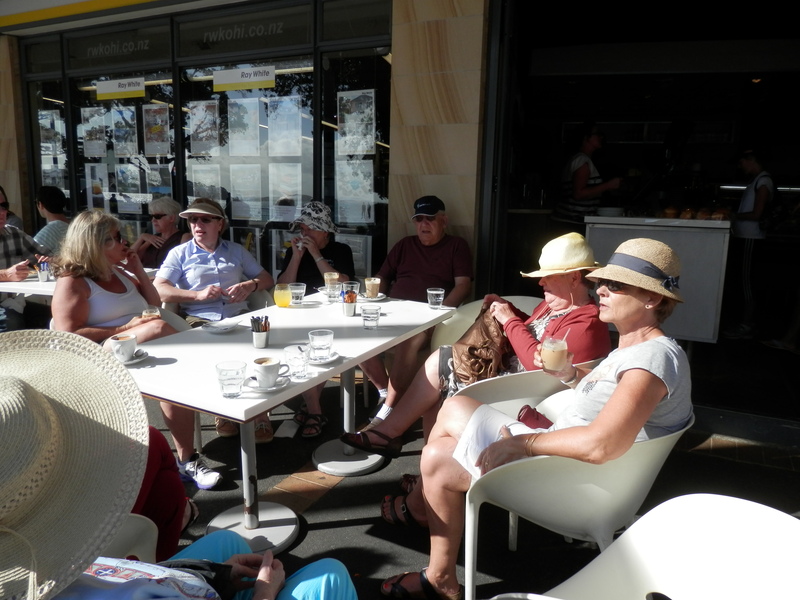 Cafe Kohi on Tamaki Drive on a summer day. Then enjoy dining outdoors whenever possible. And treat yourself to dessert. The coffee is also an art form. Is it the milk that makes the flat white so special? Or the coffee? I could write a whole post just on coffee, however a young American living in Auckland has done such a good job I am going to refer you to Sedona Wilson’s blog post. Good on you Sedona for capturing the magic of a coffee in New Zealand. P.S. Hokey Pokey is a Kiwi specialty and means it contains honeycomb. I love the Auckland War Memorial Museum so much I became a member last year. We made it one of our first stops on our recent visit to Auckland. There are so many diverse exhibits and those on the first floor change regularly so there is always something new. Even in the exhibits I have seen before I notice something new–like the room dedicated to Sir Edmund Hillary’s expedition and follow up work building schools and hospitals in Nepal. My mom and her friends expressed an interest in Maori culture and the Auckland Museum has an extensive collection of Maori art and historical artifacts. 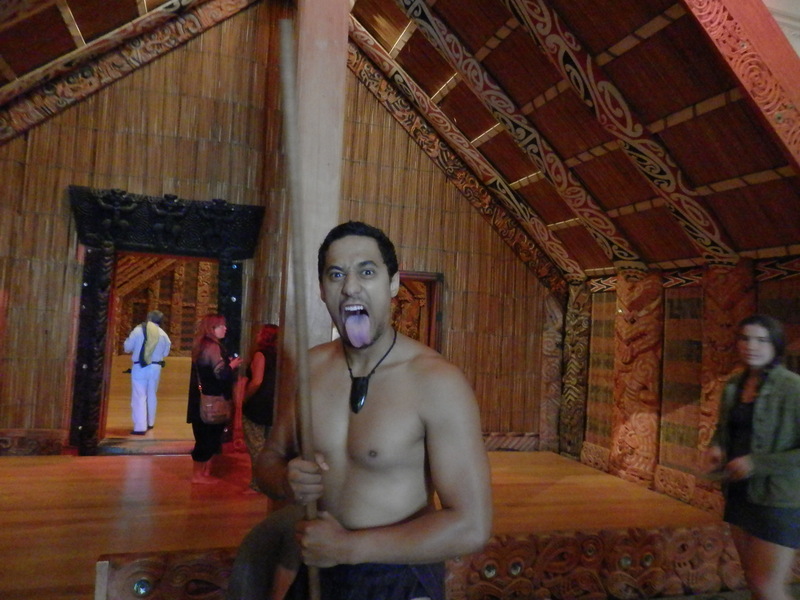 We also got tickets for the Maori Experience, a cultural performance by a talented group of young men and women. They sing and dance and explain the history of Maori traditions. When I lived in St Heliers I took a introduction to Maori class at Selwyn College taught by a woman from Ngāti Whātua, the local iwi. I recognized many of the songs, karanga, and dancing as they are still part of community celebrations. They ended the performance with a rousing demonstration of the haka. The explanation of how the haka, performed by both men and women, was an important part of sending off the young men into battle, helped me understand better why the haka is so motivational to the All Blacks rugby team. Afterward the performers went out into the hall and answered questions (and posed for my Mom’s pictures). They perform 4 times a day and there are admission packages that combine tickets for admission with the performance for some cost savings. I can easily spend a day at the museum and because we limited this visit to a half-day we did not have time to look at the natural history collections. The volcano exhibit is very popular. Do not miss the Auckland Museum–and remember that the revolving door at the War Memorial entrance stops if you touch it. Always good for a laugh unless you are the one caught in it!